“Archie Comics” casually mentioned Jughead is asexual in its newest comic “Jughead #4”, out this Wednesday, Comic Book Resources reports. 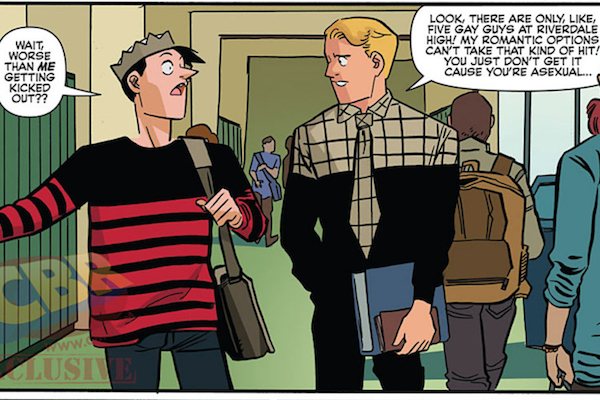 Writer Chip Zdarsky revealed Jughead is asexual during an “Archie” panel at New York Comic Con, but this is the first time it has been included in the comic. Zardsky continued that he wanted asexuality to have a place in the comic which is known for its romantic drama. “Archie” has been picked up for a live-action series with Archie and the gang, including Jughead and recently introduced gay character Keller, who will play a “pivotal role” in the show, according to Deadline.